Industrial Innovations has expanded its machine shop and fabricating capability and is now offering CNC machining of prototype, custom, and replacement parts, as well as short production runs and 4-axis machining for a variety of applications and industries such as automotive, medical, furniture, and more. Industrial Innovations announced that it has provided four Reclaim-PRO™ MSR lubrication reclamation and recycling systems to Trans-Matic, a supplier of metal stampings to a variety of industries, for use at its Holland, Mich., facility. Industrial Innovations announced that it has provided two Spra-Rite™ High Pressure Lubricant Spray Systems to Metrican, a leading supplier of tooling and stamped metal components, for use at its’ Dickson, Tenn., stamping facility. Industrial Innovations has expanded its sales reach with the addition of RDI Equipment Sales & Service to its sales network. Located in Barrie, Ontario, RDI will represent Industrial Innovations’ lubrication solutions for metal forming and stamping throughout Canada. Industrial Innovations has announced the addition of J. Williams & Associates (Westfield Center, Ohio) to its sales network, representing the company’s lubrication and automation solutions for metal forming and stamping in Ohio and Kentucky. Industrial Innovations' Spra-Rite Roll Coating system features a solid roll in sizes from 12-in. to 80., enabling the roller to be changed within minutes while the external roller lubricant application feature helps to ease maintenance. Industrial Innovations has announced that it has provided Egar Tool & Die, a manufacturer of automotive stamping dies, production stampings and welded assemblies, with three Spra-Rite™ High Pressure Lubricant Spray Systems to its Cambridge, Ontario facility. Industrial Innovations has announced the addition of Die Maker Solutions (DMS), located in Denton, TX, to its sales network. Industrial Innovations has announced the installation of a four Spra-Rite High Pressure Lubricant Spray Systems at a Tier One automotive stamping facility in Alabama. Industrial Innovations, a leading provider of industrial lubrication equipment, has announced the availability of its portable Pro-Mix™ MS proportioning systems. Visit Industrial Innovations in BOOTH #201 at the 2017 Die Casting Congress & Tabletop - September 18th - 20th, 2017, at the Atlanta Convention Center at the Americasmart in Atlanta, GA.
Visit Industrial Innovations in Booth #A5020. Our lubricant mixing, application, spraying and coolant purification systems will significantly reduce lubrication usage and cost. Visit Industrial Innovations in Booth #C18102. Our lubricant mixing, application, spraying and coolant purification systems will significantly reduce lubrication usage and cost. Industrial Innovations, manufacturer of SPRA-RITE, PRO-MIX, RECLAIM-PRO and Advance Automation products, will be demonstrating our products and technologies at the following events in 2016. The PMA Tennessee District is proud to host its 1st Annual Mfg/Supplier Night. This much anticipated event is designed to bring together industry suppliers and manufacturers to assist in business growth and the expansion of markets they serve. Use this opportunity to showcase what new technology your company has to offer the metalworking community! The 2016 Die Casting Congress & Tabletop will be held September 26-28, 2016, at the Greater Columbus Convention Center in Columbus, OH. This event will include three days of Congress sessions. North America’s largest metal forming, fabricating, welding and finishing event heads to the Las Vegas Convention Center in Las Vegas, NV. Grandville, Mich., August 26, 2014 – Industrial Innovations was visited by U.S. Congressman Bill Huizenga, U.S. Representative for Michigan's 2nd congressional district, at its Grandville, Mich. facility on August 25, 2014 to discuss how Congress can help boost U.S. manufacturing competitiveness through legislation. Huizenga and Industrial Innovations' Owner Troy Turnbull originally met in Washington D.C. in March 2014 during a "One Voice" summit, a federal government advocacy program comprised of The National Tooling and Machining Association (NTMA) and Precision Metalforming Association (PMA) designed to represent small and medium-sized manufacturers in America. Turnbull is a member of the PMA Board of Directors. Issues advocated by this group include the recent reauthorization of the Workforce Innovation and Investment Act, a job training bill that covers dozens of job training programs. This act is part of the ongoing efforts to close the skills gap in the U.S. manufacturing sector and enable employers to find and hire workers with the skills needed for competitiveness in modern manufacturing. Additionally, One Voice is lobbying for tax reform. Small companies such as Industrial Innovations create the majority of new jobs in America and the tax burden on these businesses has grown over the past few years. This growing burden for small companies increases the challenges of compliance and reduces the capital needed to grow a business, be it for training or other investment… affecting the rate of economic growth. Through an acquisition in early 2014, Industrial Innovations expanded its capabilities with the addition of the Advance Automation product line. To accommodate the growth created by the acquisition, Industrial Innovations relocated in March 2014 from Wyoming, Mich. to Grandville, Mich., where it occupies 20,000 sq. ft., nearly tripling the size of the former space. Turnbull invested in refurbishing and updating the facility with new paint, electrical, and lighting. Additionally, the company infrastructure was enhanced by new computer, phone system and ERP software investments. Grandville, Mich., August 14, 2014 – Industrial Innovations, a leading provider of industrial lubrication equipment, will highlight the benefits of plant-wide die lubrication and application systems in booth #B1311 at FABTECH 2014. On display will be a Pro-Mix proportional mixer, a Spra-Rite applicator system utilizing its patented Z-Drip nozzles and a Reclaim-Pro reclamation system. Pro-Mix systems can blend synthetic, semi-synthetic and emulsified lubricants at multiple dilution ratios. In a plant-wide or closed loop system, the lubricant mixture is distributed from the mixer via an in-plant piping network throughout the manufacturing facility for use at each press where it is applied using the company's patented Spra-Rite lubrication system. Independently controlled ejector valves enable precise regulation of the lubricant volume and placement at specific areas of stamping or drawing tools, or the stock, at predetermined press stroke intervals. The used lubricant can then be collected, cleansed and recycled using Industrial Innovations Reclaim-PRO units, which rely upon MSR coalescing plate separators to remove oil from the lubricant. All of Industrial Innovations mixing, applying and recycling systems are available in a variety of sizes and styles so that a right-sized plant-wide solution can be configured for any stamper or fabricator. Grandville, Mich., August 1, 2014 – Industrial Innovations has announced the launch of its Advance Automation straight-line digital reciprocating sprayers featuring new electrical and controls upgrades for improved reliability and user-friendly operation. Upgraded models include the SR-1155 for use with 600 – 1000 ton die casting machines, and the SR-1165 for 800 – 1600 ton machines. These reciprocating die sprayers are designed to quickly and accurately guide the spray manifold into the die area for precise placement of lubricant. These Advance Automation reciprocating die sprayers feature two axes. One is fully programmable, enabling positioning of the spray manifold into the die area. The second axis, with an 8-inch horizontal travel, allows adjustment of the reciprocator either from the control panel or handheld remote to accommodate varying die thicknesses. The reciprocators have a horizontal slide base with a pedestal mount, which can be eliminated in certain applications. A gear reducer is mounted on the top of the slide base and the main drive arm carries the vertical snout -- with the manifold attached to the end -- into the die. The snout has a 12-inch adjustment to allow different spray manifold sizes appropriate to the die being sprayed. Manifold capacity ranges from 75 pounds up to 125 pounds. You can see the SR-1165 in action here where its accuracy and repeatability is demonstrated. Industrial Innovations is a provider of industrial lubrication and automation systems for operation in metalworking industries including die casting, stamping, metalforming, and machining. Its Advance Automation product line has a 60-year die-casting and foundry industry heritage, offering reciprocating die sprayers and sprayer technology, servo ladlers, robot extractors, temperature control systems, lube reclamation units, shot sleeve reconditioning equipment, and other automation systems. Grandville, Mich., March 21, 2014 – Industrial Innovations, a leading manufacturer of industrial lubrication equipment, today announced that it is moving its operations from its location in Wyoming, Mich. to a much larger facility in Grandville, Mich. in order to accommodate the company’s recent acquisition of Advance Products Corporation’s Automation division, which significantly expanded the company’s business. At 20,000 sq. ft., the new facility nearly triples Industrial Innovations’ former space. The company is upgrading the Grandville building with new paint, electrical, and lighting. Additionally, it is enhancing its infrastructure with new computer, phone system and ERP software investments. The company will occupy the new space by March 25th. Industrial Innovations has been providing industrial lubrication systems including proportional lubricant mixing systems, reclamation equipment, and SPRA-RITE air less spray nozzles and application control systems throughout the world for over 30 years. Today, it is recognized as the largest manufacturer of metalworking lubricant proportional/mixers and spray application lubricating systems in the U.S. Troy Turnbull became president and sole owner of the company in 2010, helping grow the business through better focus and lean production methods. The company designs and produces thousands of products each year, all done in-house using proven effective engineering principles, reliable component parts, and quality construction methods to deliver optimum performance and quality. Industrial Innovations’ customer base includes OEM and Tier One companies in stamping, fabricating, die casting, and machining in a variety of industries including automotive, appliance, metal processing, housewares, lawn and garden, and more. Grandville, Mich., March 21, 2014– Lubrication equipment manufacturer Industrial Innovations’ owner Troy Turnbull has acquired the Advance Products Corporation’s Automation division, known for its die casting solutions. All products will now be sold under the newly-formed Advance Automation LLC and operations have been co-located with Industrial Innovations at a newly refurbished facility in Grandville, Mich. The acquisition of the Advance Automation product line expands Turnbull’s existing lubrication management solutions footprint within both the die-casting and foundry industries. Advance has been serving the industry since 1948 and has a strong customer base using its reciprocating die sprayers, servo ladlers, robot extractors, temperature control systems and die spray and plunger tip lubricating systems. Industrial Innovations has been providing industrial lubrication systems to the metal forming, machining, stamping and die casting industries for over 30 years. Turnbull became sole owner and president in 2010, significantly growing the business and looking for ways to expand into new markets, as supported by this acquisition. Wyoming, Mich., February 11, 2014 -- Industrial Innovations has announced the installation of its Pro-Mix and Spra-Rite systems at North American Stamping Group’s newly-expanded Portland, Tennessee campus, where the company stamps parts for the automotive and other industries. Use of these lubrication management solutions improve production rates, reduce lubricant consumption for improved environmental conditions and save money. The solution consists of a new generation Pro-Mix V system capable of mixing and distributing lubricants required for processing high-strength steel and other advanced materials. The system is capable of mixing at two different ratios simultaneously to dispense lubricant throughout the plant. For application of the lubricant, the system relies on Industrial Innovations’ patented Spra-Rite injector system and Zero-drip Z-nozzles. Lubricant volume can be precisely regulated in terms of volume and placement at specific areas of stamping or drawing tools, or the stock, at predetermined press stroke intervals. The Key to the system’s precision is the ability to independently program each injector in terms of the amount of lubricant applied. North American Stamping chose Industrial Innovations equipment based upon its successful use and associated lubricant cost savings achieved at its Querataro, Mexico, Woodstock, Ontario and Portland, Tenn. facilities. Industrial Innovations is a leading manufacturer of industrial lubrication equipment for operation in metalworking industries including die casting, metalforming, machining and stamping. The company is known for its comprehensive approach to lubrication solution development, supported by the effective engineering principles, reliable components and quality construction of its equipment. Wyoming, MI November 18, 2013 -- Industrial Innovations has announced its new, patented Airless Spra-Rite high pressure spray lubrication system. These high pressure systems are designed to adequately atomize thick, emulsified lubricants of a rich dilution, which are often required in processing of high strength steels and other challenging materials. The pedestal style allows easy transport of the equipment from press to press. 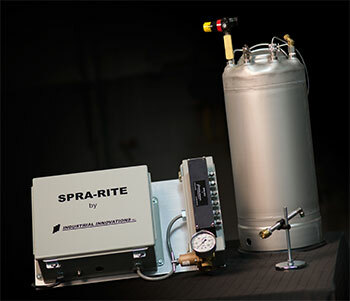 The Spra-Rite system has the ability to generate pressures of 500 psi, and then distribute the pre-mixed lubricant from the 20-gallon reservoir tank, propelling it through a filter and then thru a patented Z- nozzle, where it is atomized and applied to specific areas of the stamping or drawing tooling and/or the stock. A key advantage of the Spra-Rite system is that it features up to 24 spray nozzles, each of which is independently controlled and electrically operated for very precise application of highly viscous lubricant. The controls package offers 200 part recipe storage and individual control of cycle, delay spray, and volume. Additionally, the micro-processor controlled injector valves eliminate the need for poppets, o-rings or check valves found in other application devices. Spra-Rite lubricating systems have consistently provided users with improved production rates, reduced lubricant consumption for improved environmental conditions and, most importantly, cost savings. Wyoming, MI, November 18, 2013 -- Industrial Innovations Reclaim PRO portable separator systems for coolant purification are known for reducing coolant requirements by as much as 70% while also decreasing machining downtime. Industrial Innovations’ Reclaim PRO coolant portable purification systems come in four different sizes, all featuring 304 stainless steel body and cover construction to withstand rugged environments. Wyoming, MI, November 18, 2013 – Visitors to booth #S-4319 can see how to assist with quick die change and gain efficiency using Industrial Innovations Quick Spray Release Multi-Connection manifold. 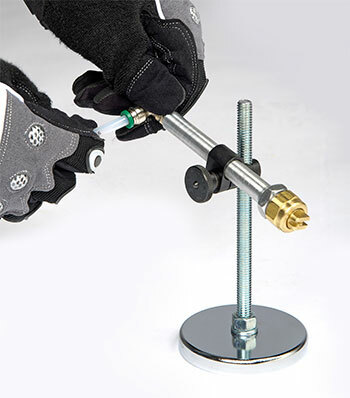 The manifold enables “one-click” disconnect and connect of multiple hoses, which helps simplify lube line hookup to reduce changeover time and ensure lubricant spray is applied where intended every time. In traditional die change, operators disconnect and then connect all hoses individually, hampering quick die change efforts. Additionally, there is a greater chance for error as the operator may potentially mis-match hoses and nozzles to deliver the wrong amount of lubricant to the wrong place at the wrong time. 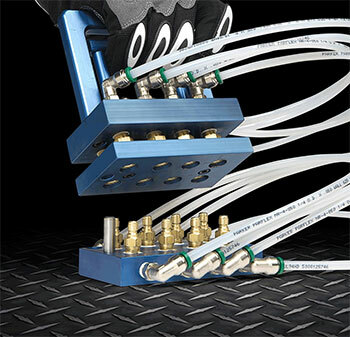 With Industrial Innovation’s one-click spray nozzle multi-connection design, each die has hoses connected to a single standard manifold. During die changeover, the operator simply unclicks the quick-disconnect manifold and removes the die. The new die is then put in place and the new manifold plugged in. The operator then loads the part program and spray profile for accurate volume, placement and timing of the lubricant. Wyoming, Michigan, Oct. 3, 2013 – Industrial Innovations’ Spra-Rite Alpha Lubricating System provides an effective, reliable, and value-priced solution for controlling lubricant application to stamped, drawn material or the tooling process, and is well-suited for smaller pressrooms and vanishing oil applications. The Alpha Lubricating System is a simple-to-install, turnkey lubricant application solution inclusive of the controller, injector manifolds, stainless steel tank, nozzles and tubing. The process control module offers numeric programming for up to six injector valves as well as a ‘purge or test’ feature. As with all Spra-Rite solutions, each injector is independently controlled, allowing for precise control of lubricant placement and volume as it is applied to the workpiece or tooling. The controller also allows for users to independently skip press cycles for pre-programmed stroke counts. Each system comes with a five-gallon stainless steel reservoir with a liquid regulator, air relief valve and strainer. Also included is Industrial Innovations’ patented zero-drip ‘Z’-nozzle assemblies with high pressure 1000 PSI burst pressure tubing for connecting the nozzles to the injector manifold assembly. Industrial Innovations Spra-Rite Alpha Lubricating System is an effective solution for smaller pressroom operations. Wyoming, Mich., May 13, 2013– Industrial Innovations has announced the addition of Manufacturing Technology, LLC (M-TECH) located in Pelham, AL, as a distributor for the company’s industrial lubrication solutions and equipment serving Alabama and Mississippi. M-TECH specializesin serving the stamping industry with over 10 years experience in pressroom products, application engineering, installation, machine repair, and training services. Focused on improving pressroom productivity and reducing operating costs, M-TECH represents leading companies that provide equipment for all areas of pressroom operations including presses, coil processing, rollforming, automation, controls, tooling, quick die change, lubrication, scrap handling, and more. For more information on M-TECH’s capabilities, visit www.mtechse.com or call (205) 637-1202. Industrial Innovations is a leading manufacturer of industrial lubrication equipment for operation in metalworking industries including die casting, metalforming, machining and stamping. The company is known for its comprehensive approach to lubrication solution development, supported by the effective engineering principles, reliable components and quality construction of its equipment. Visit www.industrialinnovations.com to find out more. Wyoming, Michigan, May 7, 2013 -- Industrial Innovations, a leading provider of industrial lubrication equipment, announces the availability of its Z (zero drip)-nozzle with magnetic base that secures the nozzle tightly to its mount, yet can easily be moved and repositioned as needed for various applications. The Z-nozzle is 99.5% drip-free, helping to eliminate costly waste in lubricant application. Designed to work with the Spra-Rite spray lubrication system, the Z-drip spray nozzles combine low pressure with high velocity to produce the most effective means of applying lubricants. The spray nozzles are available in brass, stainless or plastic with tubing choices of 1/8”, 3/16” and 1/4” diameter. Contact Industrial Innovations at 616-249-1525 or info@industrialinnovations.com to find out which style best suits your application. Industrial Innovations has been providing industrial lubrication equipment for operation in metalworking industries including die casting, metalforming, machining and stamping for over 30 years. The company is known for its comprehensive approach to lubrication solution development, supported by the effective engineering principles, reliable components and quality construction of its equipment. Industrial Innovations magnetic style “Z” series nozzles are 99.5% drip-free and easy to reposition. Wyoming, Mich., March 25, 2013 -- Industrial Innovations has announced the installation of its plant-wide lubrication management system at a Tier One automotive stamping facility in Ohio. 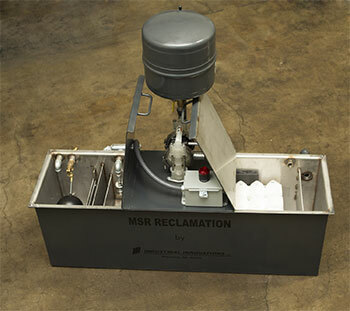 The solution provides lubricant proportional mixing, lubricant spraying capability, and a MSR-style reclamation unit to replace an existing system. Industrial Innovations designed and installed the comprehensive lubrication solution, which consists of a Triple Pro-Mix 5 system capable of mixing a lubricant at three different ratios simultaneously and four Spra-Rite application systems that dispense lubricant throughout the plant. Additionally, the solution has a MSR 33 Lubricant Recycling System for filtering of dirt particles and elimination of tramp oils, enabling lubricant re-use. The company chose Industrial Innovations equipment based upon its other facilities with successful implementations of the Spra-Rite and Pro-Mix equipment. The MSR-reclamation unit will also help the facility maintain its 14001 Environmental Management System with reduced coolant requirements and less equipment downtime. Jan 2013 Improve Operations with Spra-Rite Pedestal Lubricant Application Systems by Industrial Innovations Inc.
Wyoming, Mich., January 23, 2013 -- Industrial Innovations’ patented Spra-Rite lubrication systems precisely regulate the volume and placement of lubricant at specific areas of stamping or drawing tools, or the stock, at predetermined press stroke intervals. Use of these systems will improve production rates, reduce lubricant consumption for improved environmental conditions and, most importantly, save money. Spra-Rite system precision is enabled by independently-controlled, electrically- operated, efficient injector valves. These injector valves are micro-processor controlled, eliminating the need for any poppets, o-rings or check valves found in less effective application devices. Key to the system’s precision is the independent programming capability of each injector in terms of lubricant applied. There is ability to store and recall up to 200 spray pattern profiles with easy editing of existing programs as well as BCD-capability to communicate with most press controls. Additionally, press cycles can be skipped based upon pre-programmed stroke counts. The pedestal systems come with a minimum Two-Injector Manifold to a maximum 48- Injector Manifold assembly with a choice of air-over-lubricant or air-driven-pump pressurization and delivery. 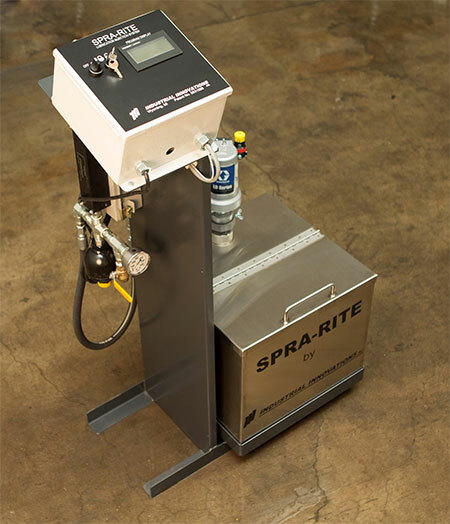 Spra-Rite controls include a PLC and a data display with alpha-numeric programming of the valves, nozzle purge or test, and dual alarm outputs for management of the safety features. Industrial Innovations Spra-Rite pedestal-style precision lubricating systems can be configured to meet specific process needs to reduce lubricant use, improve productivity and lessen environmental impact. Wyoming, Mich., December 17, 2012 -- Industrial Innovations has announced that Electrolux has implemented lubrication management systems on its stamping presses at its new North American Cooking Products manufacturing center opening in Memphis, TN. Industrial Innovations has provided Electrolux with equipment for lubricant proportional mixing, lubricant spraying capability, and a reclamation system. Specifically, the solution consists of a Double Pro-Mix 5 Lubricating System capable of mixing two different lubricants of varying mixes simultaneously and seven Spra-Rite pedestal systems – portable lubricant applicators that regulate the volume and placement of lubricant at specific areas of stamping or drawing tools. Additionally, as the new plant has been designed for LEED (Leadership in Energy and Environmental Design), there is a Lubricant Recycling System for filtering of dirt particles and elimination of tramp oils that enables lubricant re-use. Electrolux made the decision to use Industrial Innovations equipment based upon the results it has from a similar mixing and reclamation system installed at its Springfield, TN facility. The Memphis facility is scheduled to start production in early 2013. The plant will build the company’s Electrolux ®, Electrolux ICON ® and Frigidaire ® built-in and specialty cooking products. These include: Drop-in/Slide-in Ranges, Wall Ovens, Specialty Freestanding Ranges, and Cooktops.